I mentioned in one of my earlier posts, that I lost my Mom early in life. She succumbed to breast cancer in October of 1984. That put me in the 30-something range when she passed. We shared a moment that I will never forget. That same year, Easter was upon us, and Mom was still strong enough to go on an outing. I took Mom to lunch — I don’t remember where. The highlight of the story came after lunch. We were strolling down the main street of the small town where Mom lived, enjoying the windows all “dressed” for the holiday season. We came upon this lovely little tea shop. You might know the kind. You would most likely never buy anything in the shop — way too fancy for your taste, but so much fun to look at. Well, the shopkeeper had decorated the front window with little china tea cups and saucers, lovely Easter eggs, and fancy candies, and throughout the scene were chocolate bunnies, all adorned with bright, silk ribbons. But here comes the catch. The California sun had been baking down on the scene all morning, and by the time we arrived, all of the poor bunnies were melting. Their ears were hanging at each side of their heads. 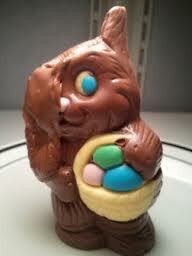 Their little candy eyes had slid down their faces and they all appeared to be sitting in a pool of chocolatey mess. Well my Mom, as sick as she was, started laughing — hard! And I started laughing. And we could NOT stop. We were crossing our legs and holding our stomachs, and bending over in convulsions of laughter. We hugged each other with tears rolling down our faces, and kept pointing at the figures in the window, so that people passing by would know that we had not gone insane, and the laughter would start all over again. It became so bad that the shopkeeper came outside of the shop and asked us if we would kindly move along. Well, we looked at each other, burst into laughter again, and arm in arm, walked down the street. Mom passed away that October. I love you Mom. This entry was posted in Uncategorized and tagged bunny, care, daughters, Easter, God, hope, inspiration, loss, love, memories, Mom, Prayer. Bookmark the permalink.